This image depicts spinal stenosis, a condition characterised by a narrowing of the spinal canal. The thickened ligament (A), called the ligamentum flavum, and the enlarged joints (C) compress the bundle of nerves in the spinal canal, called the Cauda Equina (B), as well as the single nerve root (D) leaving the spinal canal. This image depicts spinal stenosis seen from the side. The damaged facet joint (A) and the damaged disc (C) leads to the space between the vertebrae collapsing, so much so that the spinous processes (D) touch and rub against each other. The nerve root (B) is clearly being compressed and irritated. This condition is characterised by a narrowing of the spinal canal that carries the nerve roots. 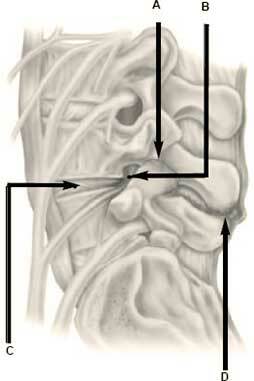 This leads to compression and ultimately dysfunction of these nerve roots. The process usually starts off in the disc with a decrease in the height of the disc as well as the weight-carrying ability of the disc. 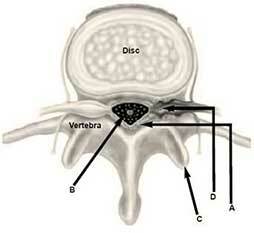 The collapse of the disc leads to compression of the nerve roots. The compressive elements are a combination of a thickening of the normal ligament of the spine, the ligamentum flavum, and the enlargement of the facet joints (see the section Anatomy of the Spine). The facet joints enlarge in response to their greater weight-carrying responsibility as the disc becomes damaged. There is usually a degree of slippage of the vertebrae on top of one another and the spine can be bent from side to side (scoliosis) or have an abnormal angle of bending forwards (kyphosis) or backwards (lordosis). This is part of the normal ageing process and is called acquired spinal stenosis. Another term is spondylosis or spinal osteoarthritis. Another type is that of an inborn abnormality, which predisposes people to this condition. People who are born with congenital spinal stenosis have a very small spinal canal. This is because the pedicles (see the section Anatomy of the Spine) are shorter than normal and do not allow for sufficient space in the spinal canal. Spinal stenosis leads to a syndrome of nerve compression that is usually a slow and progressive disease. It does not allow for spontaneous remission as sometimes seen in intervertebral disc disease, but rather has periods of slow deterioration interspersed with periods of quick deterioration in a permanently progressive condition. The inflamed facet joints and discs lead to local back pain and referred pain to the thoracic spine (chest) and down to the upper part of the legs. The nerve roots that are compressed lead to discomfort and pain in the legs called spinal or neurogenic claudication. This is a discomfort that typically occurs when walking or standing, and becomes better when sitting down. Spinal stenosis is frequently part of a crooked spine (scoliosis). The degenerative discs in combination with the scoliosis compress the nerve roots leaving the spine, causing radicular symptoms (see the section Lumbar Slipped Disc). A clinical examination by your specialist or therapist will allow for a reasonable suspicion, but the only definite way is by doing a magnetic resonance imaging (MRI) scan (see the section Tests and Scans). Sometimes, because of technical factors, a CT scan is performed (see the section Tests and Scans). This is usually when an MRI scan cannot be performed due to the unavailability of an MRI scanner, when there are contra-indications to doing a scan or when technical factors such as the presence of certain metal fusion apparatus in the spine make an MRI scan unreliable. See the section Tests and Scans for the terminology that you will find on your MRI scan report and what it means in plain English. No treatment – This is acceptable if there is no serious nerve compression – therefore in the absence of spinal claudication or radicular symptoms. There are always people who choose this option for a variety of personal reasons. This is also the option that is chosen in people who have serious medical conditions that does not allow them to have a general anaesthetic. It is rare for this condition to become better without surgery and it usually follows a progressive course whereby the range and severity of symptoms increase. Treatment that does not require intervention – Courses of painkillers and anti-inflammatory drugs can be combined with treatment from therapists to control symptoms. This is appropriate in patients with limited spinal claudication and radicular symptoms as well as in those patients who are medically unfit to undergo more invasive treatment. Limited intervention – This include procedures such as caudal or sacral block, radiofrequency rhizotomy and Nucleoplasty. These treatments may be highly effective, have very few side-effects or complications and are performed as day procedures. 1. Failed conservative management. This is when painkillers, anti-inflammatory medication and manual therapy such as physiotherapy and chiropractic treatment have been utilised for at least six weeks without improvement. 2. Pain that does not respond to any other treatment modality and is sufficiently severe to the extent that it limits your daily activities and quality of life. This includes local lower back pain, referred pain and radicular pain. 4. Cauda Equina syndrome and Conus Medullaris syndrome (see the section Lumbar Slipped Disc). The most common complications of surgery are that of infection and wound haematoma (bleeding under the skin). The most feared complication is that of nerve damage, but this is extremely rare, although not unknown. The outer layer of the nerves (the dura) can also be torn and this will lead to a leakage of spinal fluid (cerebrospinal fluid). This needs to be repaired. Speak to your specialist about a more comprehensive list of possible complications (see the section Your Back Operation). This is a progressive disease that can be treated without surgery up to a point, but mostly ends up in surgery. Surgery is successful in halting deterioration and is effective in reducing pain in most patients. Walking difficulties in the aged population, may not completely recover, due to the long-standing nerve compression which may in some cases have caused nerve damage prior to surgery.